«Madame de la Peltrie». Anonymous. Oil on canvas. 17th century. Madeleine de Chauvigny de la Peltrie was born in France in 1603. Married at an early age to Seigneur de La Peltrie, she was widowed at the age of 22. She was inspired by “The Jesuit Relations” to found a mission in New France. After recovering from a serious illness, she met Marie of the Incarnation. The two crossed the Atlantic together and arrived in Quebec City in August of 1639. 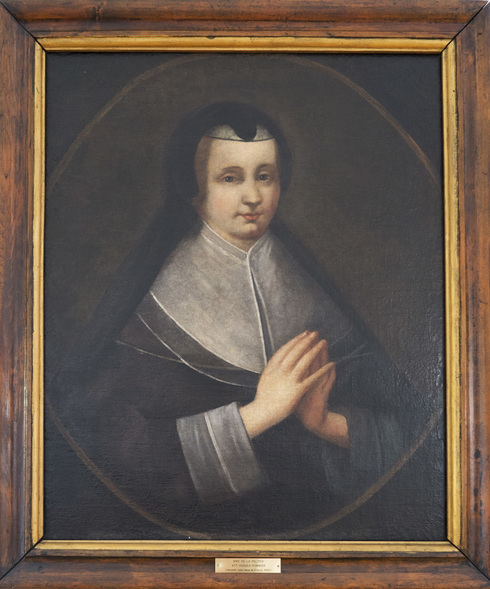 She supported the Ursulines financially for the rest of her life.